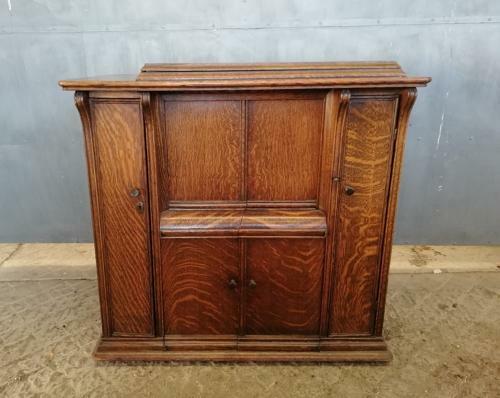 An original, oak, Edwardian Singer sewing machine base / cabinet. The cabinet has an attractive design with moulded detailing and a lovely colour and grain. The cabinet originally housed the sewing machine and pressing the release mechanism moved the sewing machine to the top of the cabinet. When inside, the cabinet lid could be shut. The cabinet has the original, decorative, iron sewing machine treadmill pedal that is hidden behind a pair of doors at the base. The cabinet has a door to the right that covers the original wiring. PLEASE NOTE this has not been tested and MUST be tested by an electrician if it is to be used for its original purpose. The left hand door covers 5 small drawers that have servicing tools and spare parts for the sewing machine. Many tools and the sewing machine manual are still present. Please note the sewing machine is NOT INCLUDED. The base of the cabinet has wheels and there are some small doors at the back of the cabinet. The unit is an attractive item and would be ideal for converting in to a drinks cabinet or other storage unit. The inner parts can be removed by purchaser to create room for storage. The cabinet is in very good antique condition with some slight signs of wear. There are some light scratches and knocks due to age. Wiring not tested and would need to be tested by electrician if to be used for original purpose. Some marks and slight discolouration in areas. The cabinet has a lovely design and would make an interesting and useful interior décor item.